We’d love your help. Let us know what’s wrong with this preview of The 2001 Anthrax Deception by Graeme MacQueen. 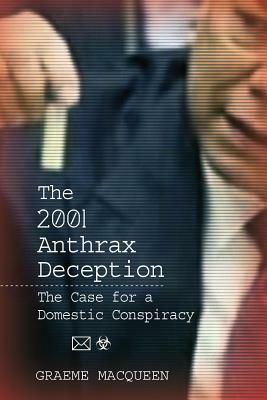 To ask other readers questions about The 2001 Anthrax Deception, please sign up. Well researched compilation of evidence and pointing out many inconsistencies with the publicly-accepted storyline of events leading up to and following 9/11. I prefer to distance myself from conspiratorial ways of thinking, but this was a worthwhile read. I wouldn't say it provided answers, however—simply raised more questions. However, this still makes it a worthwhile endeavor. Very well argued book on events that have been effectively swept down the "memory hole," out of public consciousness, after presumably having mostly served their function well. With the exception of chapters 7-9, where it becomes somewhat more disorganized, and necessarily speculative, this is very good, and filled with hundreds of citations from mainstream outlets, like contemporaneous articles in the Washington Post and The Guardian, as well as FBI and other publicly available official documen Very well argued book on events that have been effectively swept down the "memory hole," out of public consciousness, after presumably having mostly served their function well. With the exception of chapters 7-9, where it becomes somewhat more disorganized, and necessarily speculative, this is very good, and filled with hundreds of citations from mainstream outlets, like contemporaneous articles in the Washington Post and The Guardian, as well as FBI and other publicly available official documents. Chapter 7 relies on citations via David Ray Griffin, which [no disrespect to Mr. Griffin] is obviously much less convincing than would be citing sources without leaning on circuitously using a tertiary reference. He also sufficiently demonstrates the ample motive in targeting two specific senators with anthrax letters, but does a poor job of summing up the mechanisms of how it precisely ended up causing the desired outcome. Excellent book all around. Clearly and concisely argued. His conclusions arrive seemingly inescapably. Highly recommended. Dr. Graeme MacQueen is a specialist in Buddhism and has a great love of Indian storytelling. He has been a university professor and peace activist and has worked to promote peace and justice in eight countries on three continents.